I have a story to share that’s not about teaching. It’s about dogs. Actually one dog in particular - Goldie. Back in July, I was on Facebook reading the status updates. Mary, my friend from Lake Tahoe, Ca. posted a photo of Goldie, a dog up for adoption at the Rhea County Animal Shelter in Tennessee. Goldie’s face in the photo captured my heart. I went to the site, Save a Dog and posted Goldie’s information to my Facebook page. The shelter had to euthanize dogs because they had too many. Goldie’s time was limited. She had a family that loved her, but they lost their house and had nowhere to live. They sadly left Goldie at the shelter. I reposted Goldie to my Facebook page. This time, my sister in Southern California and my friend Paige in Lake Tahoe, both saw it. The Rhea County Animal Shelter’s volunteers and veterinarian, Ashley, worked with B. and got Goldie ready. They picked up a traveling crate, made sure she had food and water for her flight, had her travel papers ready and drove three hours to the Atlanta Airport to put Goldie on a Delta flight to Orange County, CA. The day Goldie flew to California, I was so excited I couldn't think of anything else. I called Mary, my mom, and my sister. I texted my nieces at school. (I'm so sorry teachers!) I tracked her flight online. My sister, my brother-in-law, my two nieces and my parents met Goldie at the airport. A scared Goldie hid under the table when she arrived at her new home, but she slowly let my nieces (ages 12 and 14) pet her. They sat very still on the sofa and quietly waited for Goldie to come to them. Goldie has a new home and was saved from euthanasia! Thank you Facebook, Save A Dog, my animal-loving friends, the Rhea County Animal Shelter, Delta Airlines and my sister! Goldie’s new name is Emma. 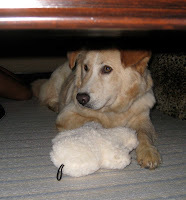 Here she is hiding under the table that first night. Awesome story, thank you for posting! Thanks! You must be a dog lover! My name is Bella and I am the Blog Manager for Dogtime.com (we created the Save A Dog application on Facebook). We think your sister's success story is great! Thank you very much for posting it. I wanted to extend an invitation to you to join the Dogtime Blog Network. I can send you further information, so if interested, please email me at Bella@dogtime.com. What a wonderful heart warming story. Thank you so much for sharing. Would love to see more pics of Emma enjoying her new family. Save a Dog is my favorite Facebook application too! Bella: Thank you for getting Save a Dog up and running on Facebook. You are saving dogs! THANK YOU! I am a friend of Mary in Goldie's story...I am at work right now, reading the story and crying. crying for Happy............thank you, everyone involved in helping to save Goldie!!! There's a link on the top right side of this blog. Thanks for writing. It is a great story. Animal people are great!